I recently wrote in utter disgust that Europhysics News magazine would publish ‘controlled demolition’ 9/11 conspiracy theories to coincide with the 15th anniversary of the terror attacks. These unfounded claims are not uncommon of course, but you’d expect them to be beneath a reputable ‘scientific’ publication produced by EDP Sciences. I find this lacking. This is a self-described scientific publication. A publication whose editorial team decided it was a good idea to mark the anniversary of 9/11 by publishing 4 separate author’s claims of a ‘controlled demolition’ – completely unchallenged. Four authors who have direct links to 9/11 ‘Truther’ movements. This was then spread far and wide as conclusive proof that 9/11 was an ‘inside job’ and why wouldn’t it be? It’s in a scientific publication after all! 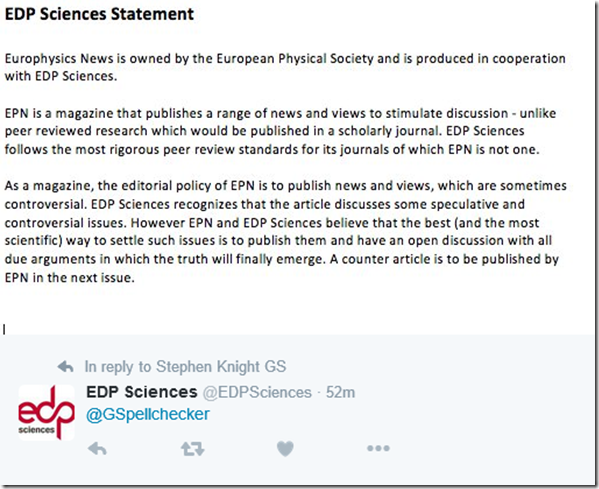 If, as EDP Sciences say, they are committed to ‘open discussion’, then why was the discussion on this completely closed to opposing arguments in the September issue? 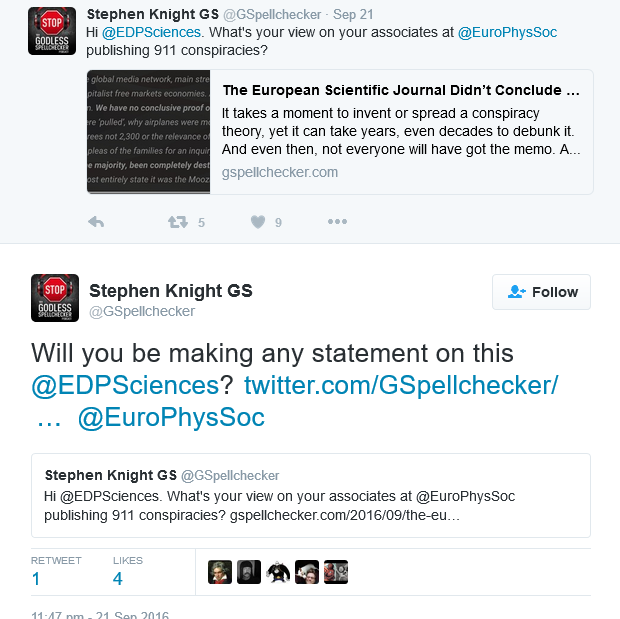 In fact, it now seems we must wait months for the counter argument to arrive in the next issue of EuroPhysics News. How is this objective and open in any meaningful sense? This offer to publish a ‘counter article’ feels like a hastily made decision to save face in light of criticism. Surely the place for an article debunking 9/11 conspiracy theories would have been in this September issue, and not the next (November) edition. Again, keep in mind EuroPhysics News didn’t publish this article in September by coincidence – they purposely decided to mark the anniversary of 9/11 by propagating conspiracy theories. The editors reveal they are fully aware of what they are doing by openly referencing ‘the timing and importance of the issue’. The damage is done. The original, unbalanced claims will exist as a standalone example for those wishing to validate these claims. Nothing less than a full statement from EDP Sciences rejecting (and apologising for) ‘controlled demolition’ claims is good enough here. 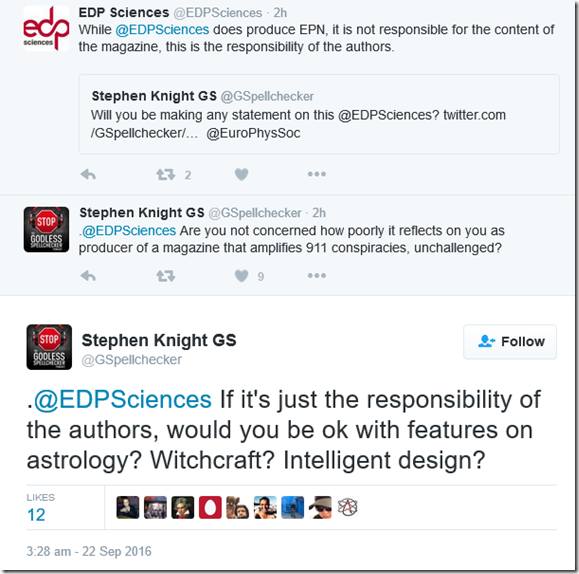 I’d also like to know, in the interest of ‘open discussion’ whether EDP Sciences would be keen to produce articles from professional ghost hunters, faith healers, creationists and psychic mediums? If not, how has EuroPhysics News and EDP Sciences decided that those things are not worthy of feature treatment, yet 9/11 conspiracy theories are? 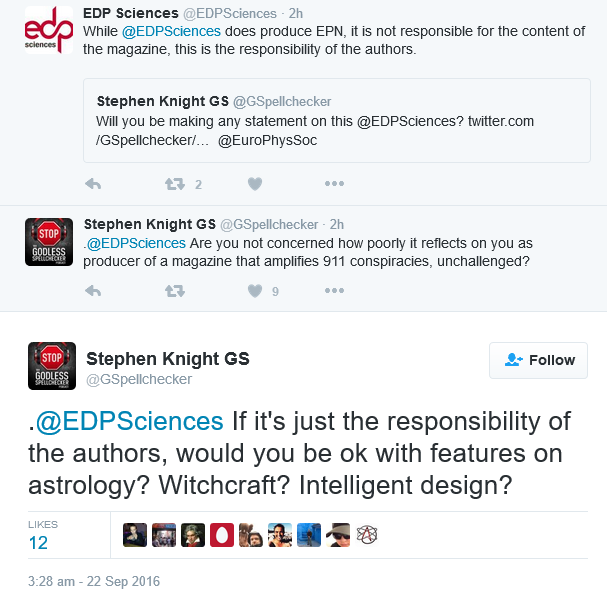 I eagerly await the counter article to this whole debacle, but one thing remains crystal clear: EDP Sciences, whether directly responsible or not, have bolstered a deeply unscientific (and disrespectful) narrative at great cost to their own credibility, reputation and the memory of nearly 3,000 people. Well done for challenging and exposing them. 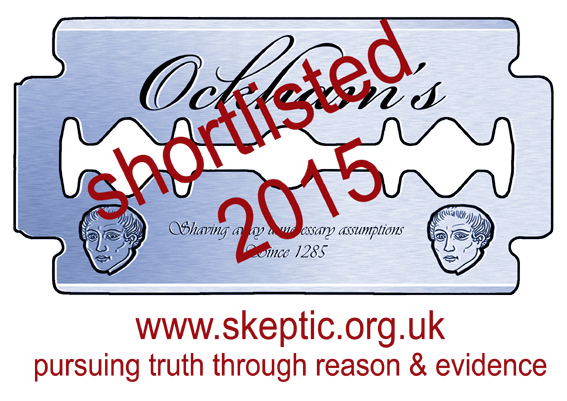 Look out for the special issue covering “flat earth” theories. It’s important to publish views “which are sometimes controversial”. A sanity check on articles would be an unwelcome impediment to true scientific discourse. The article was published because it was rooted in scientific FACTS, not emotion. What FACTS do you have to support the non-publishing of the article? Because all I hear you saying is that your feelings were hurt. They are not ‘facts’, scientific or otherwise. No amount of capital letters will change that. What we were provided however, was a collection of previously debunked claims made by a number of known 9/11 conspiracy theorists. The only thing ‘hurt’ here is this publications reputation. They are free to publish whatever they want, and I am free to judge them for it. Stephen, did EPN ever publish the counter-article in November as claimed? Do you have a link to it, or a blog post summarizing it?